I know they are from the 1918-1932 era of the USSR, judging from the art style, but I can not find titles or translations for them. I also find it interesting that the man in the first image looks like the man in the second image, just years younger. I am wondering what their origins are and what their subtitles translate to? 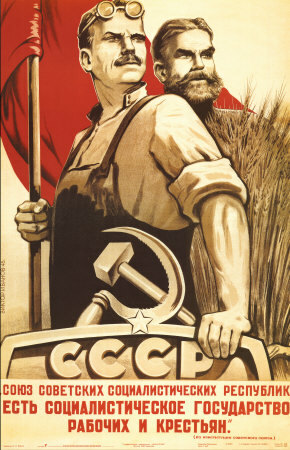 See http://www.departments.bucknell.edu/russian/const/36cons01.html (constitution of the USSR), Article 1. The second one says "VKP(b)" in the top-right corner meaning All-Russian Communist Party (bolsheviks) or All-Union Communist Party (bolsheviks). 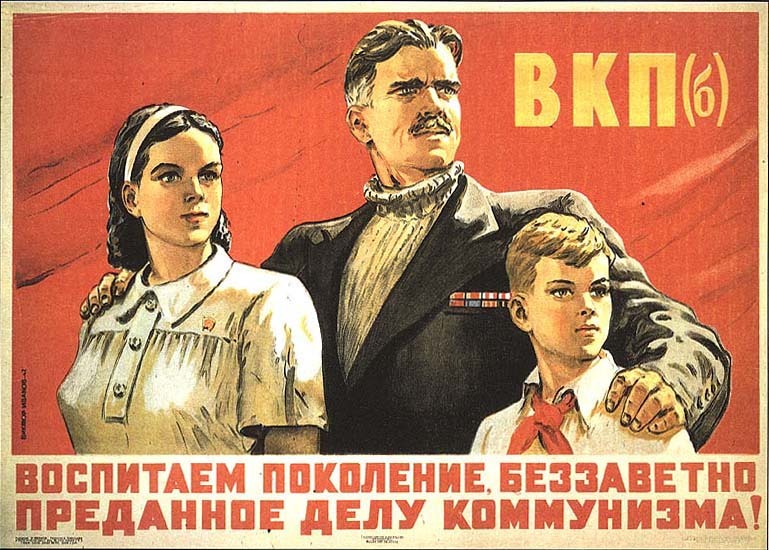 Then "We'll raise a generation, selflessly loyal to communism" or "Let's raise a generation, selflessly loyal to communism", depending on how you interpret it. The USSR was created in 1922 so the first one for sure cannot be from 1918. The cited first article of the constitution belongs to the constitution of 1936. The image clearly attributes it to the constitution (by small font below the phrase it says "from the constitution of the Soviet Union" and the entire phrase is in the quotes. So my guess is that the first one is from 1936-1937 (because later citing the first article of the constitution would look too trivial, but the same year the constitution was adopted it's ok). This design was adopted in 1944, so the second picture is definitely from a post-WW2 period, but not later than 1952 due to the name of the party VKP(b). I guess it is from 1950-1952. Not the answer you're looking for? Browse other questions tagged russia art or ask your own question. What triggered the movement from the late archaic to the early classical/severe era?